Though introduced through a mutual friend in Los Angeles in 1997, leading to a 20+ year friendship and partnership, the individual paths of Fred Rapoport & Rick Butler had a strangely similar starting point too. Both hail from Chicago and unbeknownst to either, they grew up 10 miles apart; both began playing piano during preschool and both would ultimately move to LA to pursue careers in music. And the similarities didn’t end there… Rapoport studied jazz and Butler classical piano beginning in preschool, and both were taught blues, rock and improvisation along the way, while playing in rock bands throughout high school and college. Rapoport’s style focused on emerging music technologies to create new and fuller sounds while he attended Columbia College in Chicago with a double focus on Music and Marketing. Butler went on to learn guitar and drums and focused on songwriting and organic music production, while he studied Political Science at University of Colorado – Boulder. After graduating college, Rapoport moved to LA, and started a music company specializing in music for Movie Trailers and Commercials. Butler moved to LA to start the rock band, 39 Steps, in which he was singer and rhythm guitarist. Eventually, the pair met and discovered that along with many similarities, musically, they seemed to be extremely complimentary at the same time, each balancing the other in terms of style and capabilities. A couple of years after meeting, they began to work together on PUSH, NEVADA (ABC/Touchstone), and ultimately formed the Santa Monica music house, Static Music, Inc. in 2001. 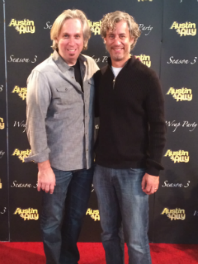 Since then, it’s been a steady climb, scoring TV shows & pilots for ABC, NBC, CBS, Oxygen, Comedy Central, Disney, Sci-Fi Channel, Nickelodeon, Commercials and thousands of Movie Trailers which lead to Fred & Rick’s work on the hit TV Series AUSTIN & ALLY for The Disney Channel. No stranger to film, they’ve written scores to Independent Films IF DAD ONLY KNEW/OUTING RILEY, AMADO & CHATTER. The duo is currently scoring THE OATH (TV Series) on Crackle and COUSINS FOR LIFE (TV Series), on Nickelodeon.